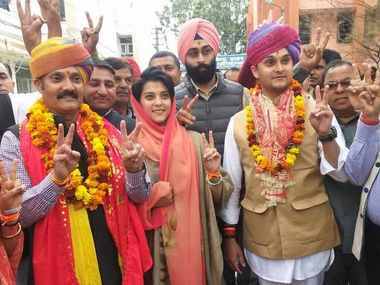 Jammu: Sealing an alliance after days of hectic parleys, the Congress and National Conference on Wednesday announced an alliance in Jammu and Kashmir for the Lok Sabha polls, while agreeing on a "friendly contest" on the three constituencies of the state. In a joint press conference, Congress leader Ghulam Nabi Azad and National Conference chief Farooq Abdullah said that while the Congress will contest on the Jammu and Udhampur seats, the National Conference will fight from Srinagar. There will be a "friendly contest" between the two parties on the Baramulla, Anantnag and Ladakh seats, Abdullah said. "I will contest from the Srinagar seat," he told the press conference. "We had a give-and-take and nobody should be under illusion that one party lost or the other won during the agreement." State Congress chief Gulam Ahmed Mir and AICC general-secretary Ambika Soni were also present at the press conference. The state sends six Lok Sabha MPs. "Friendly contest means that we will not go hard against each other and at the same time will make a joint efforts to defeat the opponents. Whether they (National Conference) win or we, it will make no difference because the (seats) will add to the national kitty," Azad said. Had the two parties entered the fray separately in Jammu, he said, it would have benefited the BJP. "And in Kashmir, if we fought separately, it is difficult to transfer votes." 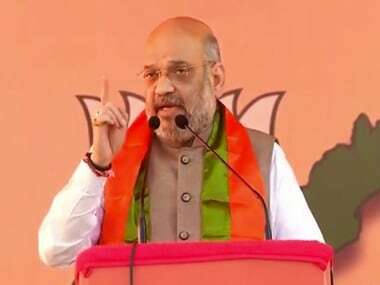 He said, "We have some MLAs in Anantnag and Baramulla and (by friendly contest) we will be able to maintain our turf." The alliance has been finalised in national interest and will strengthen the secular forces in J&K as the state faces threat from Pakistan, Azad said. "Live and let live." 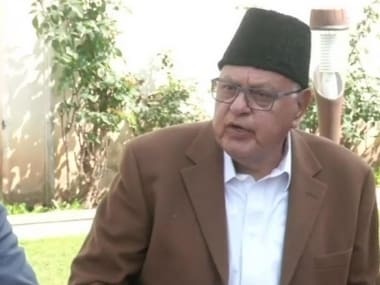 The Rajya Sabha MP said he himself and other leaders of his party would campaign for Abdullah in the Srinagar constituency, which the National Conference patron currently represents. "We have to keep our nation secular. Try hard in other places and reach an understanding (with other parties). We have to make this nation stronger and keep it secular and equal for everyone," Abdullah told the Congress. 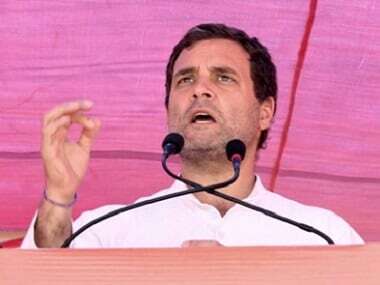 The country is faced with dangers from Pakistan and other neighbouring countries and the people living on the border in Jammu and Kashmir are the worst sufferers of the animosity between India and Pakistan, he said. "If there is peace between the two countries, the first beneficiary will be the people of the state." He said secular parties need to come together because communal forces only strengthen Pakistan, China and "our enemies of the nation and weaken the country from within". Azad appealed to the people of Jammu to vote for strengthening secularism and isolating communalism. "A communal India cannot face any nation but secular India can fight any country in the world." Meanwhile, the Jammu and Kashmir BJP alleged the Congress conceded to the National Conference's pro-separatist agenda. Azad said they were not working for BJP. "We have an alliance with like minded parties at five or six places, it (BJP) has alliance at over 40 places." On Prime Minister Narendra Modi's criticism of dynastic politics, Azad said, "The one who had no family what will he do? Abdullah also rejected the dynastic barb, saying nobody can come to power if people don't vote for them. "They are creating this fuss because they have no other issue. 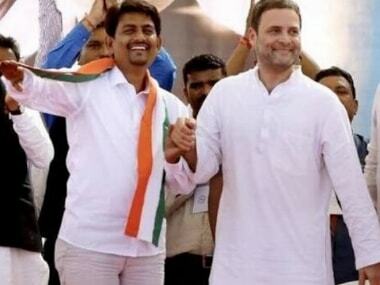 If an actor, a doctor, a film director, and others put forward their son in the same field, nobody raises dynastic thing. I am Sheikh Mohammad Abdullah's son and have seen politics form my childhood and faced problem. "Jawaharlal Nehru's daughter (India Gandhi) gave atom bomb to the nation to make it strong. She gave her blood for the nation and her son," Abdullah said. Azad said the BJP government is the most "corrupt and scandalous" in the entire world. "I have said this in presence of Modi in the house. You are not allowing inquiry from where the information will come to the fore," he said.